For the health and development of their baby, it is absolutely critical that pregnant surrogates remain healthy, and an important part of that is to maintain a healthy diet. But it’s not enough simply to know the best foods to eat during your pregnancy as a surrogate mother – some foods need to be avoided, too. 1. Completely avoid alcohol, which has been linked to premature delivery, mental retardation, birth defects and low birth-weight babies. Once you have been positively checked for pregnancy, avoid alcohol intake at all times. 2. Limit caffeine to no more than 300 mg per day. This amounts to about two eight-ounce cups of coffee (150 mg each), while a 12-ounce glass of caffeinated soda contains anywhere from 30 to 60 mg of caffeine. Don’t forget that chocolate contains caffeine – the amount in a typical chocolate bar is equal to about a ¼-cup of coffee. 3. The use of saccharin is strongly discouraged during pregnancy because it can cross the placenta and may remain in fetal tissues. But other non-nutritive, or artificial, sweeteners approved by the FDA are acceptable during pregnancy. These include aspartame (Equal or NutraSweet), acesulfame-K (Sunett), and sucralose (Splenda). These sweeteners are considered safe in moderation, so talk with your doctor about how much sweetener is acceptable during your pregnancy. 4. Fat intake should be limited – your daily intake should be decreased to no more than 30% of your total daily calories. For a woman eating 2,000 calories a day, this would be at most 65 grams of fat. 5. Cholesterol intake should be limited during pregnancy, to 300 mg or less per day. Research shows that excessive cholesterol levels in pregnant women can lead to premature births. 6. Mercury should be avoided while pregnant – avoid shark, swordfish, king mackerel or tilefish (aka white snapper), because they contain high levels of mercury. The small doses of mercury found on these fish can be toxic for your fetus, and may cause serious health problems. 7. Don’t eat unpasteurized cheeses. Soft cheeses such as feta, Brie, Camembert, blue-veined, and Mexican-style are often unpasteurized and may cause Listeria infection. There’s no need to avoid hard cheese, processed cheese, cream cheese, cottage cheese, or yogurt. 8. Avoid raw fish, especially shellfish like oysters, mussels, scallops and clams. Raw fish, including sushi and sashimi, and undercooked fin fish are more likely to contain parasites or bacteria than cooked fish. Parasites and bacteria are also very dangerous for the health of the baby. 9. Don’t eat raw or undercooked eggs and avoid foods that contain them, such as homemade mayonnaise. Make sure that any eggs you eat are thoroughly cooked, until the whites and yolks are solid. This prevents the risk of salmonella. 10. Don’t drink raw or unpasteurized milk, including unpasteurized goat’s or sheep’s milk. Avoid eating foods made from them, such as soft goat’s cheese. If only raw or green-top milk are available, you need to boil it first before drinking. Digestion-related side-effects are very common during the first trimester of your surrogate pregnancy. 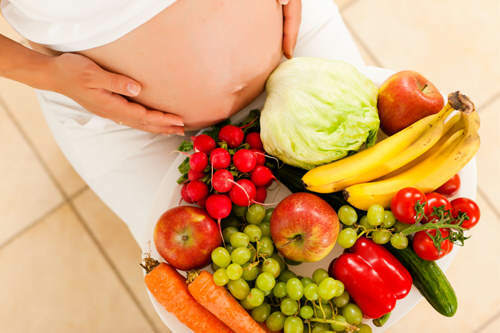 During this period, it’s especially important for surrogate mothers to eat healthy. You may experience a loss of appetite, find it hard to keep food down, or possibly feel too sick and tired to eat at all – but you need to anyway. 1. When you have morning sickness, it is advisable to eat crackers, cereal, or pretzels before getting out of bed. Remember to eat small, frequent meals throughout the day and avoid fatty, fried, and greasy foods. You can also try a wet/dry diet – this means taking your food and your drink separately, usually about 30 minutes apart. Cold foods are also advisable, since the strong smell of foods cooking can sometimes trigger unpleasant feelings. 2. If you feel constipated, more fresh fruit and vegetables are a good idea. It’s also highly advisable to drink 6 to 8 glasses of water a day to help with the constipation. Fiber is also important; when pregnant, you need about 28 grams a day of it. Good sources include whole grains, fruit and vegetables, nuts, seeds and legumes. 3. When you have diarrhea, it is best to eat more foods that contain pectin and gums, two types of fiber. This will help absorb excess water. Some good foods in this regard are applesauce, bananas, white rice, oatmeal, and refined wheat bread. 4. When you get heartburn, it’s better to eat more small meals throughout the day, as opposed to a few large ones. Some doctors recommend drinking pasteurized milk before eating and limiting caffeinated foods and beverages, citric beverages and spicy foods. You also need to avoid mint, peppermint, spearmint and chocolate because these foods can trigger heartburn. Taking a short walk after each meal can also help to ward off heartburn. 5. When you feel tired and fatigued, you may want to prepare meals when you have more energy; store them for later use when your energy levels are low. It’s important to get plenty of sleep, and naps during the day if necessary, to help cope with the fatigue. Prenatal vitamins, and mineral supplements containing iron, can also help. Remember to ask your doctor first before taking any medications or vitamins. 6. When you have no appetite, eating smaller, more frequent meals can help you avoid feeling too full or bloated. It is also a good idea to drink your calories; milk or yogurt smoothies can be a good idea, with bananas or frozen berries added in for extra protein. Calorie-dense foods can also help – you don’t need to eat a lot to get your nutrients. Snack on unsalted nuts and seeds, cheese, dried fruits, avocado, nut butters and omega-3 rich fish like salmon.